Firstly, sorry for the lack of posts lately, with term coming to an end, I had three pieces of coursework to write whilst conducting lab sessions for my dissertation so time and creativity was very limited. Anyway, as the term is pretty much over now, hopefully I'll be back with one, if not two posts a week. 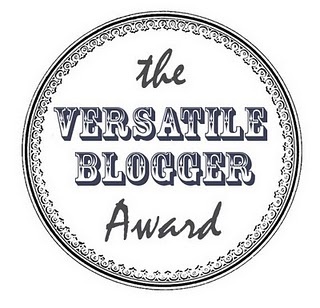 Secondly, I am honoured and delighted to have been nominated for 'The Versatile Blogger Award' by the lovely Gillie Jayne, thank you very much Gillie - my first ever nomination. Apologies in advance as my 'interesting' facts really aren't that interesting! 1./My date of birth is a palindrome (29/11/92). 2./I have never dyed/highlighted my hair. 3./I have a first class honours degree in psychology. 4./I have never broken a bone in my body (touch wood). 5./I played the flute from the age of 9-18 and reached Grade 7. 6./I was on a magic show on the Discovery Channel. 7./I once flew a Glider. None of my nominations are in order, I admire all of their blogs for different reasons. Thank you again Gillie for the nomination, I feel very privileged to have been chosen.